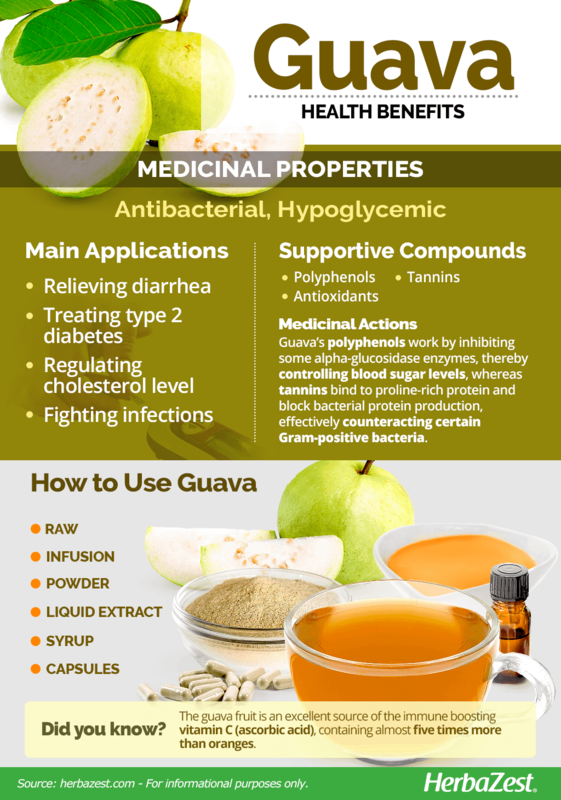 Guava is packed with nutrients, and in addition to its practical uses, it has many traditional medicinal applications. Guava is native to Central America, specifically Mexico and parts of the Caribbean. It has been spread around by humans, birds, and animals over the years. Today, it is common in warm areas of the tropical Americas, like the Bahamas, Bermuda, and southern Florida, where it is widely consumed because of its copious nutritional and medicinal benefits. Relieving diarrhea. 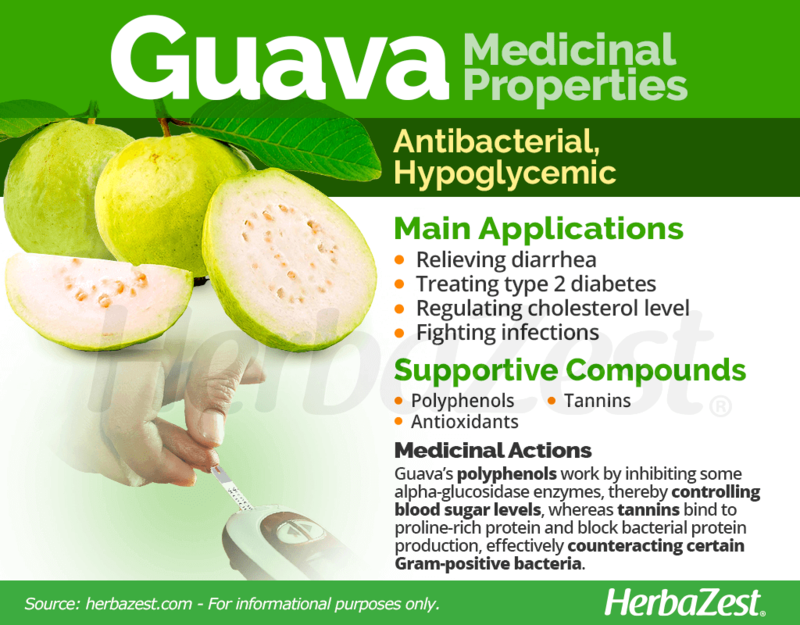 Guava possess astringent and antiseptic properties, which have long been used for treating diarrhea, particularly the one caused by Staph or Salmonella. Treating type 2 diabetes. The antioxidant compounds in guava leaves are used to reduce blood sugar levels. Regulating cholesterol levels. 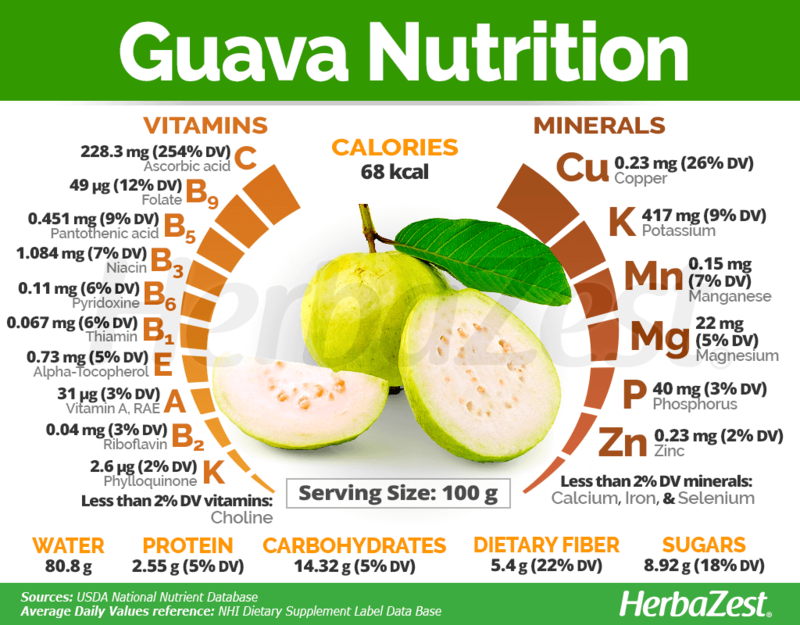 Guava has been shown effective reducing LDL or "bad cholesterol." Fighting infections. The antimicrobial properties of the plant have been shown useful for inhibit certain bacterial strains. Traditionally, guava leaves have been also used to help alleviate toothaches, as well as for treating fever, cough, mouth sores, and wounds. Guava fruit is rich in nutrients, while its leaves exhibit most of its medicinal properties. While the fruit is rich in antioxidants and dietary fiber, guava leaves are rich in polyphenols, mainly ellagic acid, and cyanidin, which are thought to be responsible of their hypoglycemic properties. They work by inhibiting some alpha-glucosidase enzymes, thereby controlling blood sugar levels. The leaves of guava are also rich in tannins, which are the main active compounds responsible for some of its antibacterial properties. Tannins bind to proline-rich protein and block bacterial protein production, thus being effective against certain Gram-positive bacteria. Guava leaf has been shown to reduce LDL cholesterol levels, though the mechanism is not well-defined. Antimicrobial properties can also be found in garlic and onion, whereas chia and lucuma have the same ability of lowering blood sugar levels. Guava is an excellent source of the immune boosting vitamin C (ascorbic acid), containing almost five times more than oranges. Vitamin C is crucial for many bodily functions, mainly for cellular regeneration, which stimulates immunity and protect the body from harmful pathogens, as well as for the formation of collagen and the proper absorption of iron. Guavas also provide high amounts of dietary fiber, necessary for digestion and the metabolism of sugars, along with copper, and vitamin B9 (folate). Additionally, guavas offer adequate amounts of many other vitamins, such as B5 (pantothenic acid), B3 (niacin), B6 (pyroxidine), B1 (thiamin), and E (alpha-tocopherol); as well as minerals, mainly potassium, manganese, and magnesium. 100 grams of guava fruit provide 68 calories, 5% of the daily value for protein and carbohydrates, respectively, and 22% DV of dietary fiber. Many people know guava for its sweet and sour taste, as well as for its popular use in desserts, but it also have medicinal applications, due to high nutrient content and therapeutic qualities. Raw. Since guava is so readily available, it is easy to incorporate it into one's diet. Creative ways to consume guava include in smoothies, soups, salads, and as a dessert. Infusion. Guava dried leaves can be brewed into a warm beverage for lowering blood sugar and cholesterol, as well as for stopping diarrhea. Powder. The dried and finely powdered pulp of the guava fruit can be added to desserts and beverages. Eating more guava is a tasty and simple way to get more daily fiber and vitamins. Liquid extract. Obtained from the distillation of guava fruits or leaves, this preparation is used topically for treating skin spots, sun damaged skin, skin rash, and other dermatological conditions. Syrup. A concentrated preparation of guava pulp, often mixed with sugar cane, can be taken orally to take advantage of its astringent and hypocholesterolemic properties. Capsule. Taking this supplemental form of guava provides all the benefits of the tropical fruit in standardized doses, which can be of help controlling both cholesterol and blood sugar levels. Raw guava can be found at most grocery stores in the produce section year round, and the dried leaves of the plant, in both bulk and teabag form, as well as guava pulp pure powder, can be purchased from online retailers. Guava is also commonly processed into jellies, juices, syrups, pies, and ice cream, which are easy to find in most supermarkets and grocery stores, as well as online. Guava supplements are available online and at some specialized health stores, mostly in the form of extracts and capsules. 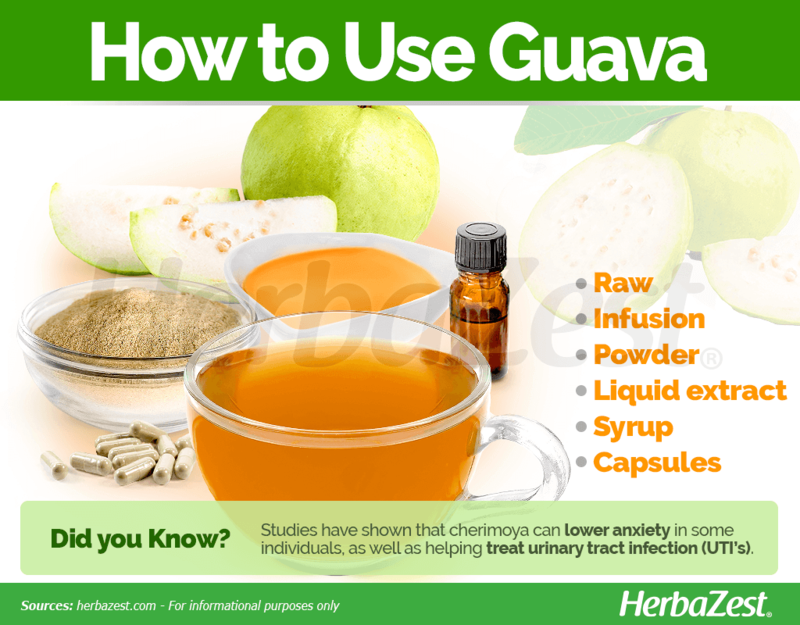 Guava is believed to have been used since the 16th century for alimentary and medicinal purposes. Guava trees grow in almost any type of soil, but require a tropical climate to thrive. If some basic requirements are meet, guavas can be grown locally. The plants can withstand a wide range of soil pH, from 4.5 - 8.2, although best yields are achieved if the soil is neutral or only slightly acidic. Guavas can be propagated from seeds, cuttings, or grafts with similar ease, although the latter will better ensure the fruit resembles that of the parent tree. It is recommended to leave ample space, approximately 13 feet (4 m), between trees when planting, and to use a generous amount of fertilizer shortly after. Pruning should be constant to promote sprout development. Guava trees may grow up to 20 feet (6 m) tall and are characterized by their large leaves and small, white flowers with numerous stamens. Guava fruit is pear-shaped, with yellow skin and pink flesh with lots of seeds. The tree bark is easy to peel off and is characteristically smooth and pale in color. 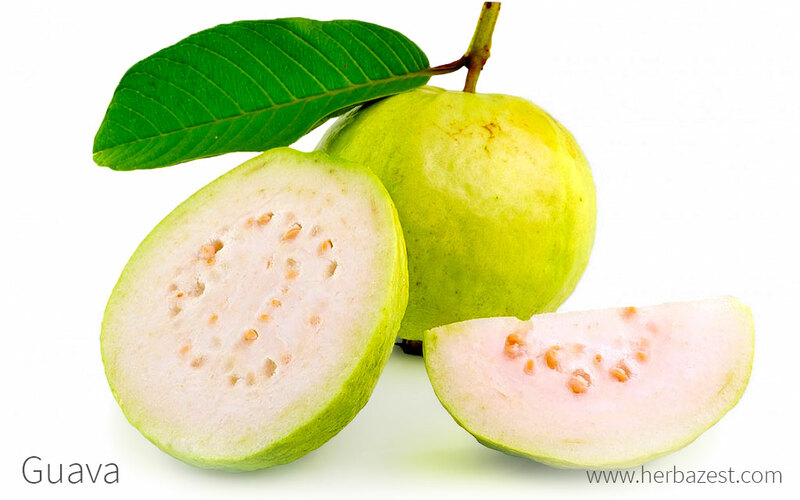 The guava genus, Psidium, includes about 100 species, being P. guavaja the most economically important. Thanks to its widespread adaptation and large market, more than 50 cultivars of guava have been developed. Among the most important are 'Sardar', 'Chittidar', and 'Habshi'. Guava is believed to have been used since the 1500s for alimentary and medicinal purposes. Early Spanish and Portuguese settlers brought guava from the New World to the East Indies and Guam. The tropical fruit was reportedly introduced in southern Florida in 1847, and now it is cultivated in places as diverse as India and Hawaii, with Hawaii being one of the world's leading producers. Guava fruit is widely consumed all over the globe, and consequently, is a major commercial industry. Brazil leads the global guava production - with 4,737 metric tons exported to the U.S. in 2011 - and Hawaii comes second in production. Guava is popularly consumed raw, but is also processed into jellies, juices, syrups, ice cream, and pies. Personal care industry. The fruit's scent is a common additive for face and body creams. Timber. Guava tree bark is widely used for carpentry and other items. The wood is fairly strong, so it is used to make things like handles for furniture, combs, and toys. Fuel. The wood of the guava tree is also used for as fuel or charcoal for barbecues.